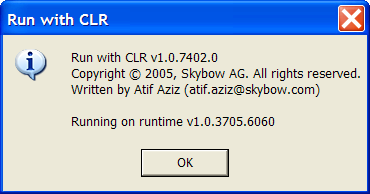 Copyright © 2006, Skybow AG. See License.txt with this distribution for licensing details. 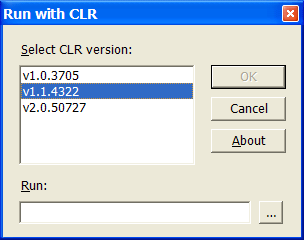 CLRAS (Run with CLR) allows you to run a managed application with a runtime version of your choice. For example, you can take an application complied against CLR version 1.0 and it run against version 2.0 of the runtime (or vice versa) without making any changes to the application code or configuration files. Sometimes you need to enforce this and other times you just want to test whether a paritcular combination of the application and runtime versions are compatible. 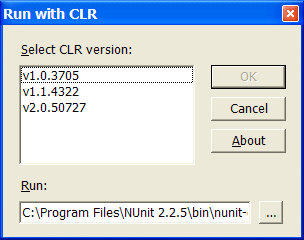 The list box will list the various runtime versions installed on your PC. Select a version, specify the path to the target application in the Run box and click OK. You can specify command-line arguments for the target application in the Run box by using the pipe character (|) as a delimiter (do not confuse this with the pipe character used to pipe applications from the Command Prompt). All arguments that you specify after the target executable path on the CLRAS command-line are passed on to the launched application. There are some limitations on how the command-line is encoded if you used reserved characters (like & or nested quotes), but it does covers 95% cases. You get an interesting effect, assuming CLRAS.EXE is in your PATH. You are passing CLRAS.EXE as an argument to each instance of CLRAS, which allows you to select different runtime versions from the list box and verify using the About box. Each time, one CLRAS.EXE will get popped off the arguments. Generated Thursday, April 25, 2019 9:40:35 PM (UTC).